When you get to work tomorrow, you'll surely be asked how your weekend was. You'll probably say something stupid like "too short." 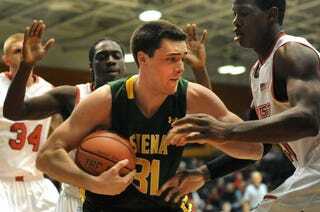 Instead, when asked about your weekend, your response should be "it was better than the Siena Saints' weekend." Siena had two games over the weekend, one at Marist and one at home against Canisius, both an opportunity to get an important win in MAAC play. Instead, they got two absolutely heartbreaking losses. On Friday, the Saints led Marist by four points with 12 seconds to go. Simple probability would indicate that Siena would win in that situation more often than not by a large margin. However, a couple of miscues led to them doing the opposite, as Marist pulled the rug from under them in the final seconds. As if that wasn't brutal enough, the Saints nearly upset Canisius, who entered Sunday's action in fourth in the MAAC standings, taking them to triple overtime (!) before succumbing to a forty point effort from Canisius' Billy Baron. So, not only did they lose, but they lost while playing nearly an entire extra half of basketball, which looked downright hellish on the legs of a relatively young team. In both games, Siena outplayed their opponents for large sections of the action, but were unable to come away with a win in either game after the cruelest endings imaginable. College basketball can be a brutally unfair game sometimes, man.